This is a blog for amateurs, by amateurs! 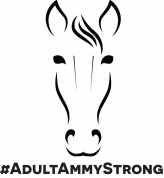 Get your ads & messaging getting in front of the people you want to see it - the adult amateur equestrians who have the desire and decision-making power to buy equestrian-related products and services. Sidebar ads will be 300x250 linking to your website or a specific product or service. ​Advertisers can provide new graphics and links monthly. Ads will be placed above the 'Popular Articles' and are limited to three advertisers per month to keep the page layout clean..
​Placements will be product/industry exclusive to avoid direct competition. Space is limited and on a first-come-first-served basis.